Geraldine Barkworth speaks about Metacommunications - talking about talking - and Individuation - the individual's growth path toward wholeness. In particular, Geraldine discusses the eternal quest to find your authentic voice, the precarious courage it takes to be different and how to relax into your unique style. 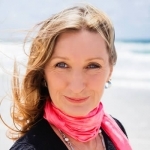 Geraldine is the director of Goddess Of Public Speaking, a specialised coaching and training business, begun in 2002 and based near Byron Bay, northern NSW Australia. Geraldine's conversational speaking style shows listeners simple ways to tap into their inner speaker and communicate with ease and authenticity, anywhere and anytime. She uses a gentle body-centred approach that encourages groups to get involved and have a touch, see, hear and feel experience. Geraldine's innovative and interactive approach is described as the "polar opposite" to standard public speaking advice. She invites everyone's inner speaker out to play with a blend of mindful awareness, humorous wisdom about the human condition and practical physiological insights of body language. Geraldine opened our conference and got us warmed up, relaxed and focused. We often referred to her presentation throughout the four days. It was a highlight of the conference! I particularly liked the way Geraldine spoke about at their core, clients need to feel safe and secure and that we need to be aware of this and respond accordingly to the emotion. The message of interacting with others with a clear purpose, from the heart not just the head is an important one. Her presentation was fantastic. Awesome workshop – the techniques are useful and effective. I saw real fear on people’s faces this morning and they were much more confident by the afternoon. I found your workshop very valuable. It created a lot of discussion and the team are applying various ideas generated from the workshop. We really appreciated you tailoring the presentation to us. A “Must Do Workshop!” Engaging, challenging and hands on experience. Geraldine embodies the principles she teaches. Your personal approach as a speaker ensures the listener identifies with what you are saying; I found you inspirational. Access to their own Inner Speaker through a hands-on touch, see, hear and feel experience. Emotional and social intelligence through deepening presence and authenticity. Practical skills to craft a succinct message that rings true and connects heart to heart. Paradigm shifts in behaviour and belief with less struggle and more ownership. Energy, inspiration and step-by-step "this is how to to do it" know-how. You are welcome to watch and listen to Geraldine speak informally in her Lounge Room Series, 3 Minute Video Tips. Who Is Professional Speaking & Training For? Professional Speaker and Trainer, Geraldine Barkworth will travel to your premises or event location. Presentations and Workshops are specifically for corporate organisations, academic institutions and government agencies wanting to offer specialised personal and professional growth training in the area of metacommunications. Presentations are suitable for mid to senior level staff who need to communicate with authenticity, professionalism and impact to build trust-based long term relationships. What Kinds Of Presentations and Workshops Do You Offer? Our Presentations and Workshops are about Metacommunications - talking about talking - and Individuation - the individual's growth path toward wholeness. Workshops can be delivered as half, one or multi day events. Many suit delivery occurring over several weeks or months to give participants time to integrate, practice in the "real world" and report experiences back. Don’t worry, no one will be put on the spot and asked to give a 20 minute talk about the death of their first pet. In fact, your level of participation is up to you. We will be working individually, in pairs, small groups and be doing lots of deep listening, speaking, experiencing, written and spoken exercises and some fun body-stuff. Springboard templates and lots of practical examples are provided for workshops which concern creating content. Be assured, there will always be enough chocolate to go around. Overcoming public speaking fear and avoidance, facilitating groups and workshops, leadership presence and speaking influence, finding one's unique voice, speaking with impact not boredom, communicating with body language and voice, crafting content, work life balance for overachievers, meditation for people who can't meditate. What Can We Expect In Working With Geraldine? Presentations are tailored to each organisation and event to "hit the nail on the head" every time. The Facilitator, Geraldine Barkworth, works with the organisational representative to understand how to seamlessly weave in in-house issues, languaging and case studies. Pre-Presentation work in the form of Questionnaires, Surveys or Interviews are designed to engage participants and identify burning issues. Speeches are mostly 60 minutes. Workshops are mostly in a one day format. They can be easily modified to half or multiple days. For long term benefits and sustainable change, we find that delivering training as a series of half days spread over weeks and months, reinforced by online training and individual coaching creates the best results. Training methodology can include: presentations from the facilitator, individual exercises, pair work and small group activities, written, verbal and experiential exercises, interactive games, personal reflection and planning. We work with the values of safety, choice, trust, creativity, empowerment, balance and authenticity. Post-Presentation work in the form of questionnaires, evaluations or follow up online seminars and individual coaching reinforce learning and increase behavioural change, personal awareness, organisational engagement and ownership of new ideas. Geraldine's Presentations are usually a blend of speaking and training. She's a "workshoppy kind of speaker." You can specify your preference depending upon your event needs. Sometimes one delivery style is better than the other. The cost of a one day workshop or presentation to your organisation will be in the range of $1800 - $2,500, depending upon participant numbers and level of customisation. Travel expenses are additional. Ideal participant numbers begin at 6 and end at 36. Most workshops are run with 20 or less participants. Higher numbers mean less personal interaction and instruction. Lower numbers mean much more hands on interaction and thus increased opportunities for learning and change. One day Workshops can be modified to half and multi-days to suit the organisation and participants. Speaking Presentations usually range from 60-90 minutes. The cost range is $1,000 - $2,000, depending upon your requirements. Inclusions are included in the quote proposal and based upon discussion of presentation needs. They could include pre and post individual coaching, pre and post questionnaires, follow up group teleclasses, ebook courses and professional speaking. Contact Geraldine Barkworth to ask for a Presentation Proposal based upon your specific event requirements. All presentations and workshops are designed and facilitated by professional speaking coach and trainer, Geraldine Barkworth. Geraldine is the director of Goddess Of Public Speaking, a coaching and training business specialising in creative techniques to overcome speaking fear and to find one’s authentic voice. Although based in Byron Bay in Northern NSW Australia, thanks to online technology she works with people all over the English speaking world. Geraldine is a member of the International Coach Federation (ICF) and National Speakers Association Australia (NASA). To book Geraldine Barkworth to present, please contact her personally by email or by phoning 0478 575 250. Geraldine will be happy to assist you with the design and delivery of a presentation that best suits your event and budget. Organisations are invited to consider offering a packaged blend of speaking / coaching / training / ebooks to add value for clients, staff or delegates.